There is functional and structural scoliosis. Functional scoliosis refers to the way we use our body in daily life. 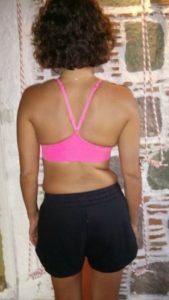 Asymmetries can be seen, like in the shoulders up or down, different length of flanks of the torso or the neck etc, however these asymmetries are not integrated into the bone structure of the body. When they bend forward, their spine is straight and the asymmetries are vanished. When having a structural scoliosis asymmetries will still be seen, but they integrated into the spinal structure. I have worked with many students who have scoliosis. Practicing yoga has helped them tremendously. Here some pictures taken in the course of 5 months. The student here has scoliosis to the left in the thoracic spine with a cobb angle of 42%. In the yoga sessions she especially stretches the tight and short areas, in her case especially the right lumbar area. 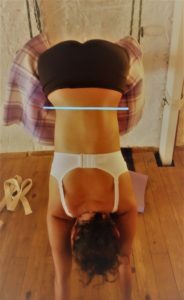 On the picture to the right you can see her lying in shalabhasana lengthening her back by stretching her right arm forward to create length in the right flank. Her left arm is bent and she pushes with her fingers into the floor to strengthen her left upper back as the muscles there are weak. She keeps her lower back long by moving the tailbone into the floor. This work is a combination of lengthening and strengthening asymmetrically. 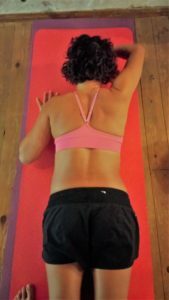 We can see that the muscles left to the lumbar-thoracic spine have eased after 3 months of stretching and strengthening. After such intensive stretching strengthening MUST follow. It is important to have enough time towards the end of the session to relax in restorative pose(s) followed by a long shavasana (deep relaxation) so that the work can be integrated into the musculoskeletal system. NEVER hang students unprepared into ropes, this can destabilize their spine and cause severe damage. This student was able to hang in ropes because she had practiced yoga before. In order to create more space in the right lumbar area I have her breathe into her lower back to the right. This works really well in supported forward bend like the child pose. Breathing brings awareness into tight area and helps the intercostal (between the ribs)muscles to lengthen. To align the spine backward stretches can be very helpful and soothing, like in supported setu bandha sarvanghasana. We have been working together on a regular basis since summer 2015. 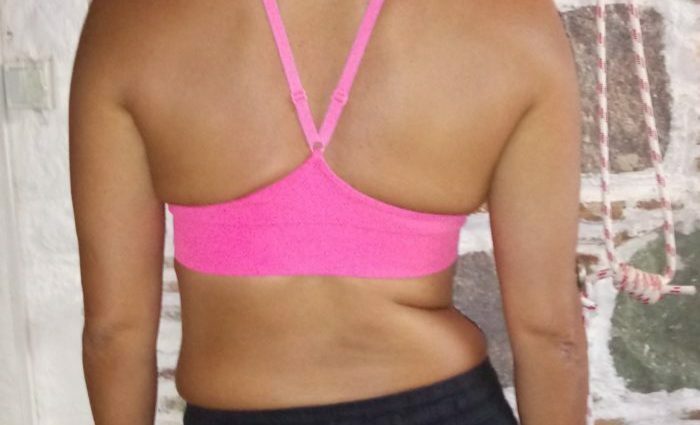 The cobb angles of her scoliosis were about 47. She was told that she needed eventually an operation. At the beginning she was not able to do many asanas. Her arms were very weak and she could do the downward facing dog only with a belt or a rope around her groins. After 2 years of practicing she was able to hang in the ropes and work in there. 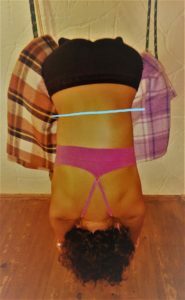 We are now working on backward bends like the upward facing bridge (urdhva dhanurasana).